If my blog name is any hint, I don't have the longest attention span. Anything repetitive is bound to bore me. One block quilts? Snooze. Give me a sampler though and I'm game! 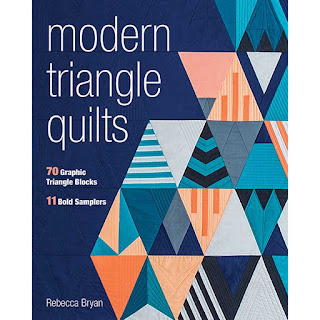 That's why I've been dying to get my hands on my dear friend Rebecca Bryan's second book, Modern Triangle Quilts. In late 2015, when Becca was scrambling to make all of the quilts for the book, we decided to do a trade. 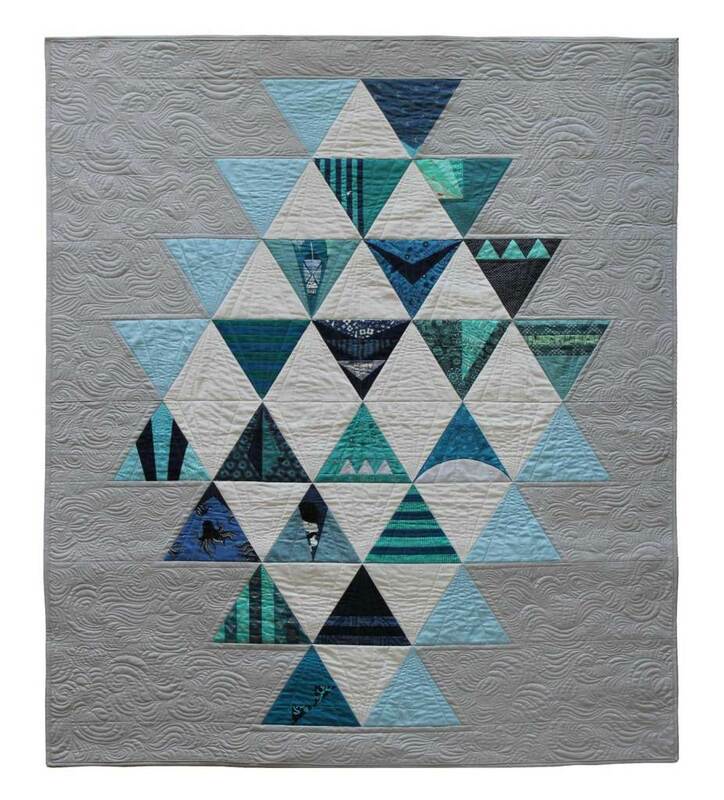 I'd piece one of the Skylines quilt for her book, and she'd make a quilt for the Luna Sol Quilt Market booth in spring once all the triangle quilts were taken care of. I was a little skeptical when she sent me a box full of Kona solids, (I'm a print girl for life), but I had a blast sewing that quilt and I love the way it turned out. Leave it to Becca to choose the perfect color palette, am I right? I had another fun "interaction" with the book when I did a pet portrait of Becca's pupper, Bruce Wayne, lounging on the Isosceles Sampler. 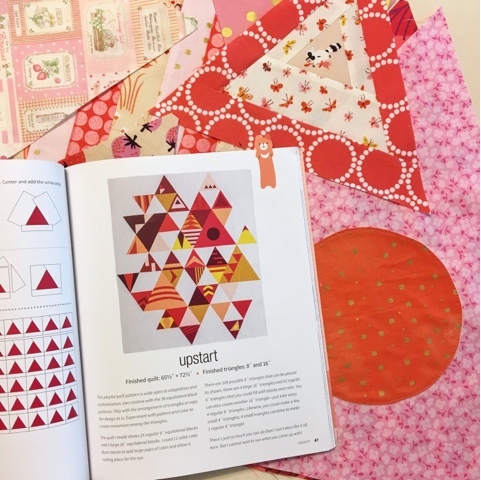 Since getting my physical copy of the book earlier this week, I've already started on the Upstart quilt in a girly pink, peach, and red palette. I love pulling a pile of prints out of my stash and diving right in. Samplers are perfect for that. Most recently, I contributed a block to a the Well Wishes charity quilt to benefit Living Water International. Even if I my block only took me 10 minutes, it feels cool to be a part of such a stunning project! (My block is the one touching the bound corner below.) And guess what? You have a chance to win the quilt! Check out Becca's blog post for full contest details. To be entered to win the quilt we made, purchase the $5 Well Wishes quilt pattern via Becca's shop (100% of the proceeds of this pattern will go to Living Water International). Each purchase equals one entry. As part of the blog tour, C&T is giving away one copy of Modern Triangle Quilts to one of my readers. To win, just leave a comment on this post and I'll pick a random winner on Saturday April 15th at 10am CST. I'll contact the winner via email. Don't forget to check out the rest of the blog tour for more chances to win this book! I've been drawn to simpler blocks recently so this would be a great addition to my library! Your pet portrait is so darling. This book seems great. I love your solid sampler--stunning!! Very cool triangle quilt. This book would be so nice to win! Cute doggie also. The charity quilt deal is very amazing, people helping people, awesome!!!! I love the equilateral triangles and would to experiment with some of these patterns! I love triangle quilts! I've made three. Thanks for the chance! I really like your girly choices of fabrics for the UPstart qulit...I'd pick the same colors! Triangle quilts have always been a favorite of mine. Interesting blog tour. 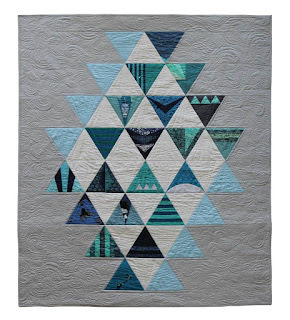 I like triangle quilts and I am really beginning to like modern quilts more and more. I love triangle quilts! For me they are a challenge, I would love this book! 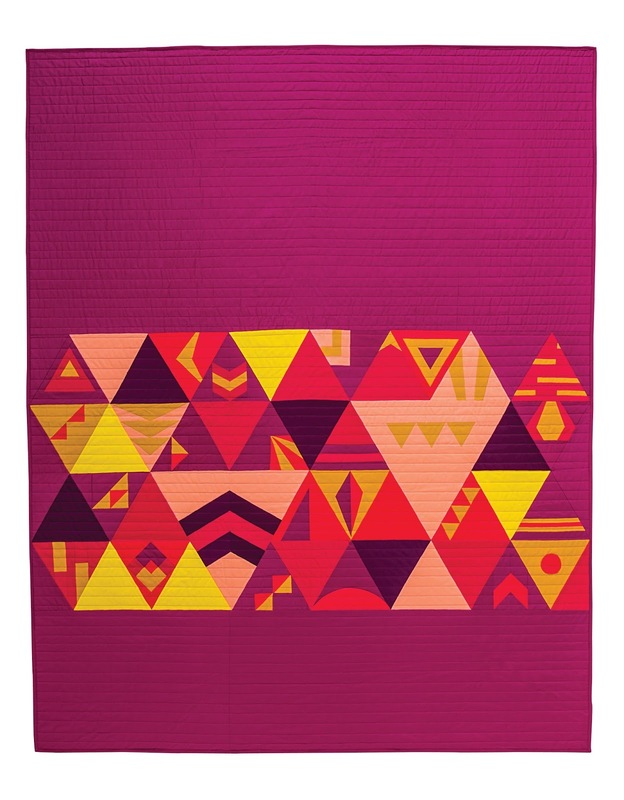 I love triangle quilts and I love sampler quilts, so this is perfect! Sampler quilts are fun, love your all solids quilt. This book looks amazing. Thanks for the chance to win! I love triangle quilts. They're fun to make and there's something about them that's so appealing. I love your quilt. The solid and prints look great together. Looks like a great book..what fun. Thanks for sharing the giveaway! I like the idea of a block unit that is a shape other than square. Nice! This book looks like so much fun! I love your samples and can't wait to see your finished piece! I absolutely agree with you about the appeal of piecing a sampler quilt rather than the same thing over and over. Mary Lou Weidman sums up the loss of enthusiasm I feel about making those "over and over again" quilts in the introduction to a couple of her books--it was such a relief to read it and know that I wasn't alone. It's been a long time since I was excited about a quilting book! I'm so happy for Rebecca! Loving your upstart quilt so far! 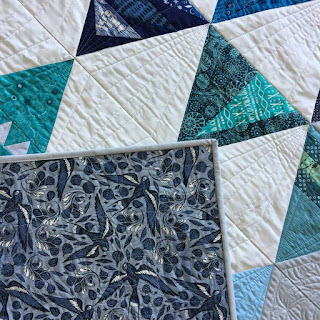 I love triangle blocks and would love to have your book to satisfy my thirst to make one of your quilts! This book looks like so much fun! I need to get back to seeing stat! I love the quilt that everyone worked on together. What an awesome idea. Can't wait to check out this book & make my own triangle quilt. Felice Regina, cool to meet you via blog and Becca's blog hop. 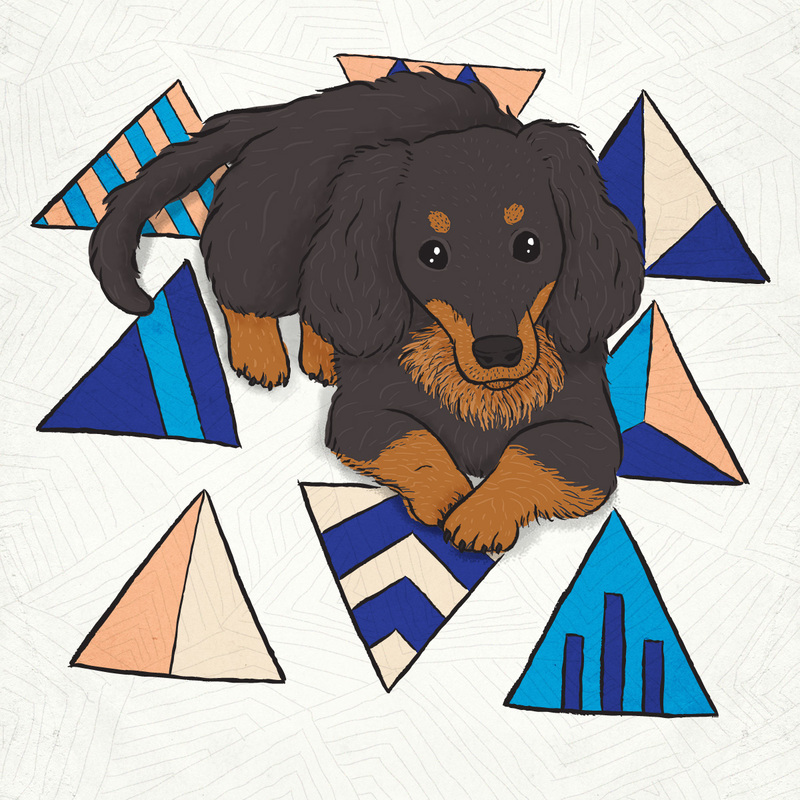 Awesome illustration of her pup enjoying the his triangles. Beautiful curation in your block of the reds, peaches, and pinks. 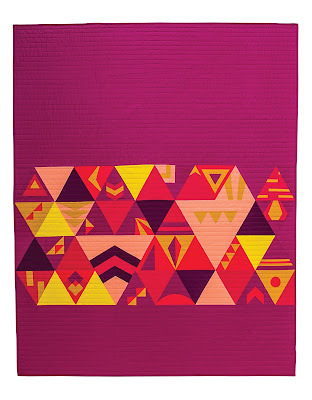 I am falling in love with Modern Quilts & Triangles! I have a triangle quilt in my UFO'S that was started before Halloween in 2016. I don't know why I haven't finished it, but this is my inspiration to pull it out and finish it. I would love to study this book! This would be a fun book for my fellow quilting friends and myself! thanks! Wonderful idea to make a charity quilt for this blog hop. I have this book on my wishlist! I LOVE the pet portrait of Bruce Wayne! The book, the patterns, the colors oh my.